Megan is one of the poets who will be featured in the Honoring Our Rivers Student Gallery Exhibition (April 6-27) and reading at the opening reception April 6, 2018. 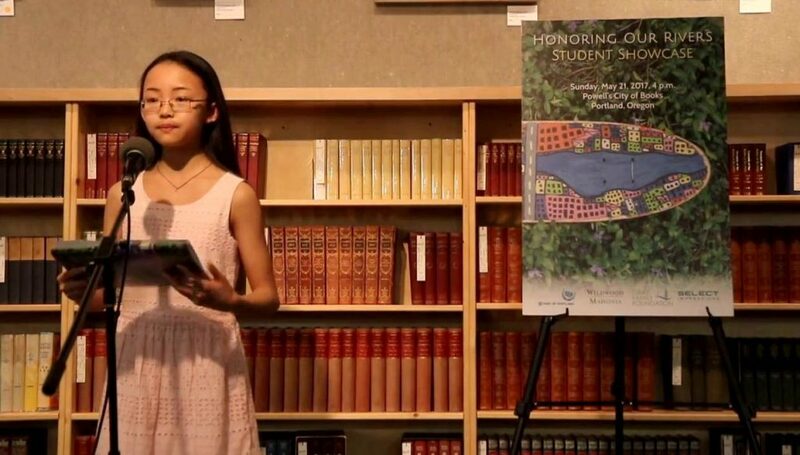 Here Megan Tian read’s her poem, “Four Seasons,” at Powell’s Books at the publication release of last year’s student anthology. 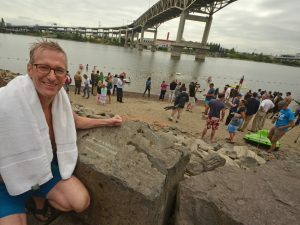 Lake Oswego, Ore. — Advocacy is not just for adults, and conservation is not just for scientists. 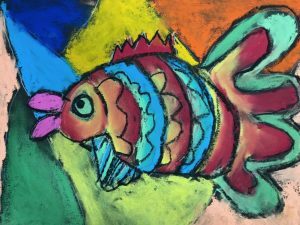 This Friday at the opening reception of the Honoring Our Rivers Student Gallery Exhibition in Lake Oswego, you can hear an eighth grader’s rhyming account of the salmon’s epic journey and learn what a fifth grader hopes for Oregon’s rivers as students show off their poetry and artwork inspired by the state’s freshwater ecosystems. 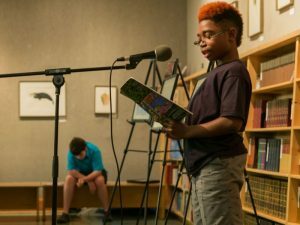 Willamette Partnership and the Arts Council of Lake Oswego are celebrating National Poetry Month with the monthlong exhibition of river-themed poetry and art by some of Oregon’s youngest published students. The students featured in the gallery exhibition, ranging from elementary school to high school, are kids who have been published over the years in the Honoring Our Rivers Student Anthology. The gallery will also feature the works of local, professional artists and authors, including painter, Christopher B. Mooney, poet and artist, Marilyn Stablein, and fused glass artist, Charlie Tellessen. Every year, Honoring Our Rivers invites regional authors and artists, such as Mooney, Stablein, and Tellessen, to be featured in the publication to inspire kids and give them an opportunity to be published alongside professionals. Since 2000, the Honoring Our Rivers project has engaged the creative capacities of young people to encourage river stewardship and to nurture the next generation of civic and conservation leaders. While the publication is the cornerstone of the project, Honoring Our Rivers also hosts student gallery exhibitions and readings, puts on professional development workshops for teachers, and most recently, works with outdoor schools to help integrate more creative writing and art into outdoor environmental education. Honoring Our Rivers is currently accepting submissions of student art and poetry inspired by Pacific Northwest Rivers for the 2018 edition of the anthology. The deadline to submit is Earth Day, April 22, 2018. See submission details here or contact the project coordinator at info@honoringourrivers.org.